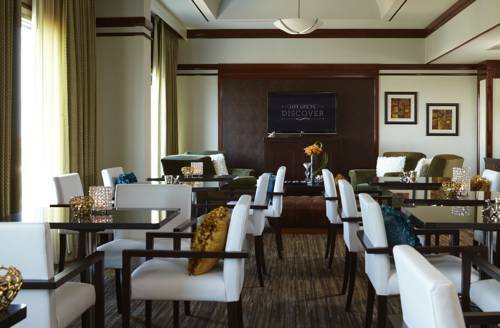 Surround yourself with stylish comforts at Renaissance Concourse Atlanta Airport Hotel. We streamline your travel routine by providing a complimentary shuttle to and from Hartsfield-Jackson Atlanta International Airport. Visit a variety of popular destinations including the Georgia International Convention Center and Clayton State University. Retire from your adventures in our upscale rooms and suites. We provide plush bedding, flat-screen TVs and 24-hour room service for your ultimate convenience. When hunger arises, dine at Concorde Grill, serving delectable Southern cuisine and cocktails. Need to host an event? Leave a lasting impression when you have your business convention or fairytale wedding in one of our 35 event venues. Take your special occasion to the next level with our professional planning services. Active travelers can maintain their exercise regimen at our 24-hour fitness center and two pools. Awake refreshed when reserving accommodations at Renaissance Concourse Atlanta Airport Hotel. Concorde Grill: Perched above the Atlanta airport, our on-site restaurant serves flavorful Southern cuisine to please every palate. Watch airplanes take off and land while enjoying delectable fare and refreshing cocktails in our sophisticated ambiance.